AN EU-FUNDED drive to develop a viable electric commuter is being spearheaded by Piaggio, with backing from KTM. The project aims to develop cost-effective electric vehicles that will tempt motorists away from their cars - and the EU thinks two of European biking's big guns are the right heads for the job. Piaggio and KTM will be supported in the project by other industry experts, including Bosch - who has been a leader in electronic bike technology, such as cornering ABS. Several universities are also involved, including the University of Warwick in the UK. 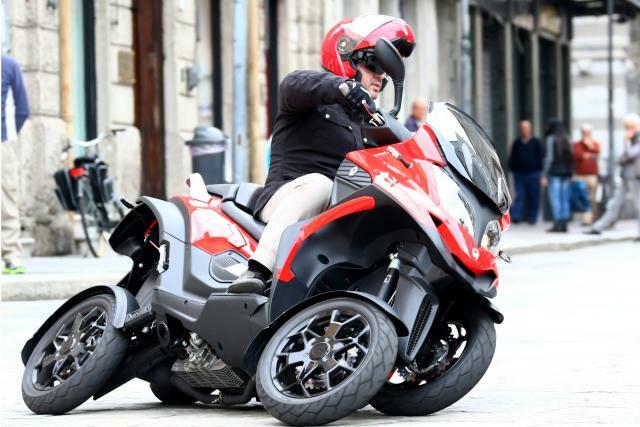 The aim is to create two tilting four-wheeled demonstrators – one a ‘moped’ class (L2e), the other a larger L6e category machine (quadricycle) similar to the Quadro 4 we tested. The technology is also being specifically designed to work on two-wheeled motorcycles, with a target of 2018 for the completion of the project. But before the serious work starts, those behind the project are looking for input from potential customers and users of such machines with an online survey. So if you want to have your say on a project that just might one day influence the bike you ride, go to http://kwiksurveys.com/s/dhQNyznd and tell them what you think. Mascot suit worthy of CE-approval?